Whether you enjoy ironing, hate ironing or do it only when you must, before you buy an ironing board, consider your ironing habits, needs and your space available to get the best selection for you. You may even be surprised to find that there are numerous creative ways to use or recycle an ironing board. Portable or Built-In Ironing Board? Portable ironing boards are usually found in two sizes, stand-alone and tabletop. The advantage of a portable ironing board is that you can move it from room to room. Built-in ironing boards are usually installed in a drawer or a wall cabinet by professional installers in the laundry room or in a bedroom closet. Kits are available for homeowners to mount boards on a closet door or into a special panel. This ironing board is fastened at the top, anchored only on one end and drops down from the door. This option is a great space-saver. You should consider what tools may be necessary to mount the ironing board and whether you have the technical knowledge to do it. If you have room for a full-size ironing board, choose the widest ironing board that you can find for easier, more effective ironing. A full-size ironing board is one that is at least 4 feet long and 12 to 18 inches wide. A small tabletop model is useful for craft projects and quick touch-ups but not good for full-sized garments or linens. If you have a built-in ironing board, it should be set at hip level for the person who does the most ironing. Hip level is best if you iron standing up. For those who rotate between standing and sitting when ironing, a portable board is preferable because it is easier to adjust up or down. Older ironing boards were often made of wood. They were very sturdy but very heavy and not the ideal material for effective ironing. Look for an ironing board with a metal, mesh top that will allow steam to pass through and evaporate. A lightweight metal board is easier to set up and fold down for storage. It also enables you to move from one place to another with less effort. While a lightweight ironing board is desirable, it should also have a sturdy frame that will not collapse or tip over easily as you do your ironing. A stable board makes ironing easier and can prevent accidents like the boards falling over onto small children. An ironing board cover with good padding is essential to getting good results. Most boards have a cover included in the purchase; however, you may wish to upgrade. Some covers feature non-stick or reflective surfaces. The non-stick qualities prevent clothes from sticking to the board; reflective surfaces transfer the heat back into the clothes which makes the job easier. The cover should be smooth and permeable to heat and steam. Teflon-coated cotton covers will not stick to your clothes and make it easy to clean away any build-up of starch or sizing. The best pad is one lined with heavy felt. It will hold its shape better than a foam-lined pad. Ironing board covers have come a long way from generic grey to nearly every color and design. You can find one to match almost any decorating style or hobby. Most are fitted with a pull drawstring but you can find them with an elastic edging. There are also clips available to help hold the cover in place. 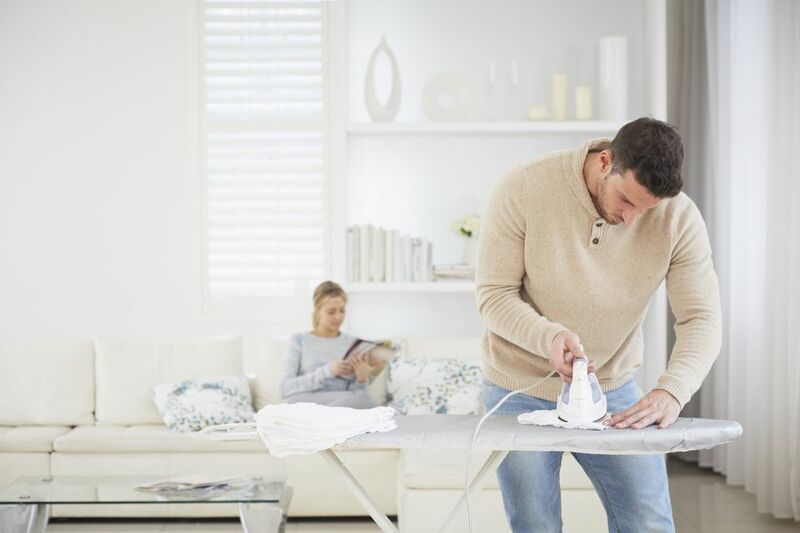 If you do a great deal of ironing, you may wish to opt for these extra features that will enhance your results and make your job easier. Sleeve Attachment – a small board - about 2 feet long and 6 to 8 inches wide - is attached to the main board and is used for ironing sleeves and small articles of clothes. Iron rest – a built-in at the wide end of the board that expands the usable area for ironing and prevents the iron from falling off the board. Hanging Rack – attached at the wide end of the board, the rack is at least head high for hanging newly ironed clothes. Storage Hook/Organizer – keeps ironing board off the floor and all ironing tools together. Which Indoor Clothes Drying Rack Is Best?